It was a cabin of about sixteen feet square, formed of unhewn timber, filled in with ‘chinking’ of clay, some of which had fallen out, and admitted both light and cold. The creaking door, hung on wooden hinges, was fastened with a wooden latch, and opened in the same inartificial manner as that of Red Riding-hood’s grandmother. So rude in all respects was the workmanship of the room, that it might be questioned if a single nail had been expended on it. The floor was formed of unplaned boards, that had been employed in the construction of arks, which, after conveying the emigrants, had been converted into their habitations. . . . Mrs. Stanley look around despairingly, . . . at seeing what she was given to understand was the best room in the house . . .
Mrs. Symmes had a difficult time adjusting to her new abode but she became close with members of her husband’s family. Nonetheless, she missed her own friends and relatives. In late April 1798, she decided to make her first trip back east to visit her family but also to reunite her niece, Susan Anne Ridley with her mother. Moreover, the young girl’s further education needed to be considered, and Aunt Susan probably felt that the wilds of Ohio were no longer suitable. The 24th. April 1798-at 3oClock P.M.I embarked at Cincinnati in Mr. Goudy’s keel boat to ascend the Ohio to Pittsburgh on my way to the City of New York—the Passengers Mrs. Gillman, Mrs. Zeigler & Miss Greene & Mr. Simmons bound for Marietta, Mrs. Chambers for Chambersburg, her son in Law mr. Israel Ludlow accompanies us. My Niece Susan Anne L. Ridley who came out to the Miamis with me, I now take back to her Mother to be educated in N.Y.—we reached no farther than Columbia the 24th a settlement 6 miles above Cin[cinnati]: half a mile below the mouth of the little Miami—this first night Susan Ann & myself lodged at Major Stites’s, the rest of the Party at Kibby’s Inn. . . .
25th. April wednesday morning at 11 oClock left Columbia; gained only 6 miles the river being very high, encamped on the Kentucky side, a heavy shower came on at the time we had supped & pitched our tent which did not cast off the rain so we were considerably soaked, it continued raining all night—our Health did not suffer in consequence of it. 26th. 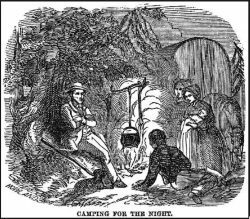 thursday A high contrary wind this day obliged us to lie still, until the afternoon, when we advanced only 7 miles, & encamped in the woods again that night. 27th. friday—Reached Mr. Walters Cabbin, tolerably accommodated. 28th Saturday—Nothing remarkable; at night encamped in the Forest. 29th Sunday—Reached Limestone [later Maysville] in the evening 65 miles from Cin: supped & lodged at Mr. Martins Inn—a disagreeable Town, tho one of the most considerable Landings in Kentucky. Our Company heartily tired & sick of the boat [it] being amazingly crowded, very dirty, & no convenient place for preserving our provisions—the river being full, the boat keeps us near as possible to the shore, so that [we] are greatly incommoded by the limbs of trees that . . . tear down the awning, break the [posts] that support it, often endanger our heads . . . ; the boat heavy laden, weakly manned, the men making too free with Whiskey; all these circumstances combine to retard our progress, & promise a tedious passage. 30th Monday morning left Limestone, could not make our Stage at a Cabbin, had our usual resource the woods—a little above Massy’s Station, & the 3 Islands, which present a beautiful & picturesque view, Massy’s Station occupies a beautiful bottom on the Indian side, at the point of the lowest of the 3 islands – we had an agreeable walk on the bank opposite this settlement—we find our daily rambles in the woods very refreshing, & a prodigious releif [sic] from the boat, we walked . . . faster than the boat moved. . . .
Susan Anne Ridley (1788-1867) married Theodore Sedgwick, Jr. (1780-1839), and became a well-known novelist of children’s literature, e.g., The Young Emigrants (1830). In her later years, Susan Livingston Symmes lived with the Sedgwicks in Stockbridge, Massachusetts. Her tombstone states first that she was the daughter of William Livingston, and second, the ‘relict’ (widow) of John C. Symmes. From “Some notes of Mrs. Symmes passage up the Ohio 1798”, fragmentary pages in the William Livingston Papers, at the Massachusetts Historical Society. The illustration is from The Young Emigrants. There are many reasons to move from one place to another: adventure; new job opportunities; fleeing a hostile environment; joining relatives to make a fresh start; marriage. These certainly accounted for many who made the trek westward after Congress passed a series of ordinances to survey, divide, and offer at public auction any lands ceded to the Confederation. It was a proposal of marriage that determined SUSAN LIVINGSTON’s move from the East Coast to a spot on the Miami River in Ohio. 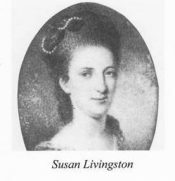 The eldest daughter of thirteen children born to Susannah French and William Livingston, the first elected governor of New Jersey, Susan (“Sukey”) was well-educated by her parents, witty, courageous, and politically astute. She had sometimes assisted her father as his secretary; had undertaken the education of her young nephew Peter Augustus Jay while his parents, John and Sarah Jay, were in Europe during the Revolutionary War; had taken care of her parents at the end of their lives (1790); and after, had moved in with her widowed sister Kitty Ridley (Catharine Livingston) and her family in Baltimore. It must have been quite a surprise to her relatives when she suddenly married John Cleves Symmes in September 1794. Accompanied by her 6-year old niece Susan Anne Ridley, Susan Livingston Symmes and her husband John set out for Ohio. How Susan coped with the move is hinted at in a letter to her sister Sarah Jay and her niece Maria Jay, a year and a half later. I had the pleasure of a letter from you last Novr. it ought to have been attended to long before this, but having nothing material to write, I delayed from time to time until I feel very much ashamed of myself. We have no news here. We lie snug beyond the tempests of Politicks & the gay Circle of pleasure. Each one is engaged in cultivating his Plantation. At present the whole Country is busy in making Sugar from the maple Tree . . . we have too much business on hands to make any ourselves. . . .
Our house would probably have been nearly finished could we have pleased ourselves with a Site, we have a beautiful one on the Ohio, but too many conveniences must have been sacrificed to perspectives. The Miami is a contemptible stream compared with the Ohio, yet we have concluded to build on it 3 quarters of a mile from the Ohio, the Village occupies this space; we have the Miami river in front on a western view, to the North we have a mile of beautiful level bottom land, along the east bank of the Miami about 200 Acres; this bottom is skirted along the east by a range of hills covered with timber, & from which 3 rivulets descend & cross the bottom; between the house & the Miami are about 10 acres perfectly level, on the left or rather South of which is a wood divided by a never failing small stream of water which passes by the east end of our house, at the distance of 40 feet with the addition of a very fine Spring, about 10 feet beyond the brook, or 50 feet from the house, this brook as it divides the wood on its way leaves about 3 acres of the grove a perfect level, next to the intended Garden & Courtyard; this small wood, & the brook terminating in the Miami. You will from this description think it a Paradise something like it I assure you might be made. I only wish we were on the spot which I do not expect to be until late in the autumn. . . .
. . . . I have a good house building 4 rooms below & 4 abo[ve] with a kitchen adjoined to it by a Linto 30 feet long, stone Cellars under the whole, the house is 44 by 40 feet, the Passage only half way thro the house so that the 44 feet is divided into 2 rooms, it’s a plan of my own I do not know how it will answer; I have suffered much from the want of a good house in this Country, it was a great transition from your Papa’s house [the Jays’ house in New York City] to Cabbins. . . .
John C. Symmes (1742-1814) was a justice of the New Jersey Supreme Court, and had been a member of that state’s constitutional convention as well as a member of the Continental Congress. In 1788, Symmes had been named a judge in the Northwest Territory, settling in North Bend, Ohio. That year, he and some friends created a company and purchased over 311,000 acres from Congress. President Washington signed the patent on October 30, 1794 conveying the land, known as Symmes Purchase, for $225,000. There was much controversy over this purchase at the time as well as afterwards. Susan and John Symmes had serious financial disagreements about her right to control her money even before their marriage. No doubt his financial difficulties and speculating irregularities played a large role in her decision to leave him for good in 1807. The house burned in 1810. For more on Susan Livingston Symmes see posts HERE, HERE, HERE, and HERE. This letter is at the Rare Book & Manuscript Library, Columbia University.